In short, you use an oscillating spindle sander set on an angle to sand away the center indent, and a spacer jig set over the locking guide to sand away the two smaller indents. 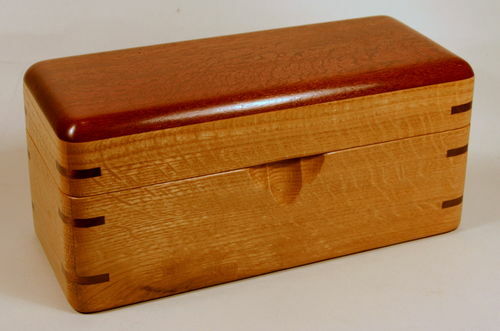 If you are just making one or two boxes, at the end of this tutorial I will make suggestions for how to do this same task much more simply if you don’t want to make the jig, modify the table top, or buy a locking straight edge. Thanks to Maplerock aka Jerry for coming by the shop to help me with these pictures. This year I have been using a three-part finger indent for my boxes. As requested, this is a how-to tutorial for how I make these lifts in my shop. Skip to the end if you want a scaled down version of this technique. When this process is finished, it looks like this. The Goal: We want to cut a centered finger lift in the front of the box. The process starts with an Oscillating Jet Table-Top spindle sander like this. Like some of you, I bought a spindle sander some time back for another project. It has been just sitting around the shop with nothing much to do since. So once I came up with this design for my boxes it had a job, and we both were happy again. 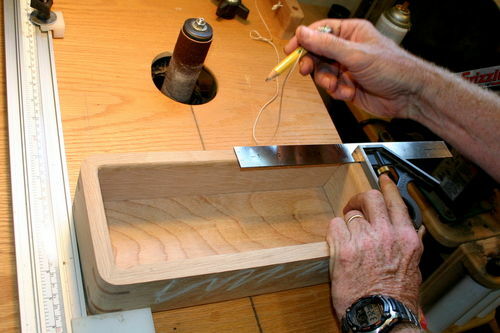 Modifications: If you are just making one box, you could use the original top of the tool, but there is not much room to work. 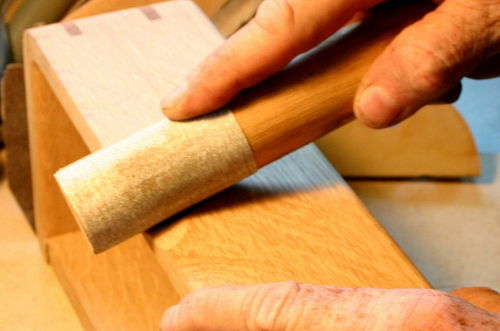 The same steps are used if you are working on the original tool’s top. Since I make a lot of boxes, I modified the tool. I added a bigger, half inch plywood top. On the back side of the top, it has a frame around the tool’s original metal top and is fastened down securely with a tapped-in threaded knob. I also added a line drawn from the center of the spindle down the board. There is a removable cleat on the left hand side that comes in handy when the table is slanted. The next modification is a clamping straight edge. I would also recommend an accessory such as a wide jaw or added squaring attachment. 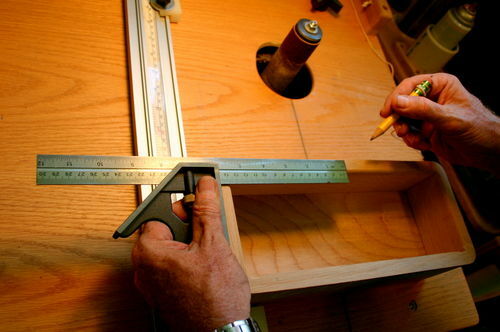 (Pictured below) It helps to keep the clamping edge square to the line and will add accuracy. Make a guess at the center of the box and hold the combination square on one side of the box like this. Mark the end of your blade. Now flip the combination square to the other side and mark the end of the blade. Like this. It is difficult to judge the center of a 12 inch box. It is easy to judge the center between two marks an inch or so apart. (This method works if your guess is long or short.) Move your blade to the center of the two marks (the center of the box) and draw a dark mark at the center. Be sure your blade is set at the center mark. Keep your blade locked down and use it for the next step. 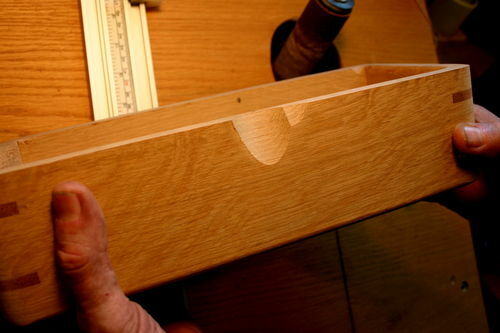 Using the spindle center line as a base, and your combination square as a guide, set and lock the straight edge so the spindle will cut right at the center of your box-front. Making The First Indent: Slide your box up the guide being sure it is touching all along the guide and is square to the center line. Lightly touch the box to leave a small mark. Check to see if it aligns with the center mark you added to the box. If the spindle is not aligned with the mark, you can still make changes and sand away your mistake at this point. Now sand your center finger lift. A steeper angle on the sander will give you a shorter, deeper lift. A more shallow angle will give you a longer lift. There is no formula here, but bigger boxes generally look better with longer lifts. 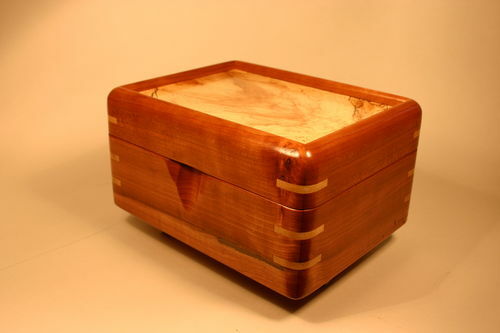 Don’t sand so deeply that you go through the thickness of your box. Hooray! The center cut is complete. You can stop here or you can add the two small indents at each side. 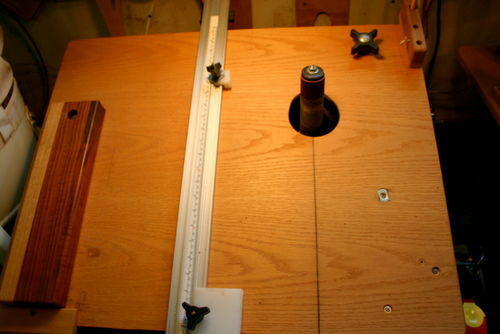 I use a simple jig to space the three notches evenly with no measuring. Look closely at this shot of the jig that lays over the guide. The right-hand walnut spacer is 5/8 inches wide. 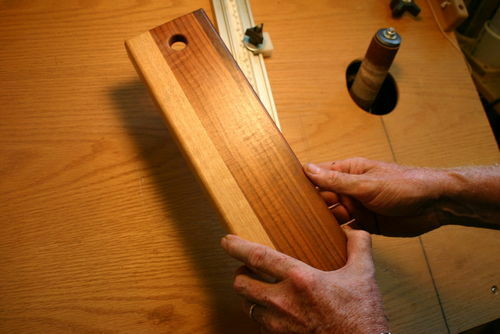 The light maple wood spacer is 1 1/4 or 10/8 inches wide. The center piece is as wide as the guide. So, the maple spacer is twice as wide as the walnut spacer. How The Jig Works: We can use this jig to move the box into three positions. When the narrow spacer is between the guide and the spindle, the box is centered on the spindle. 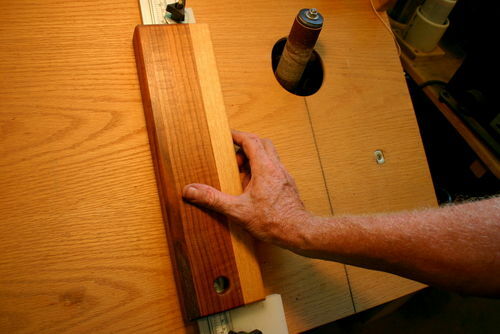 When the wide spacer is between the guide and the spindle, the box is moved 5/8 of an inch further from the guide. When we take the jig off the guide entirely, the box slides 5/8 of an inch toward the guide. There is no measuring and the three notches are in the right place every time. 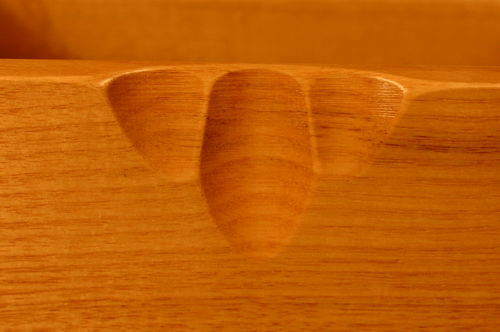 Add a steeper angle to the table top, move the box over to the bear guide and slide it to the spindle. It just takes a slight touch here, and it will look like this. 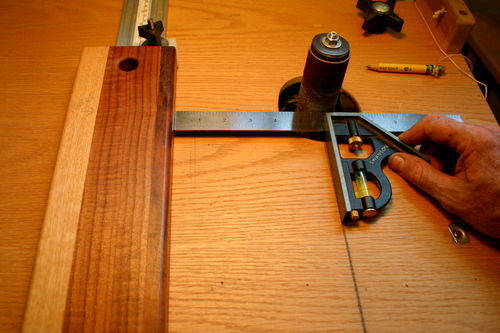 Now, put the thick side of the spacing jig over the guide and make sure the thick side is facing the spindle. 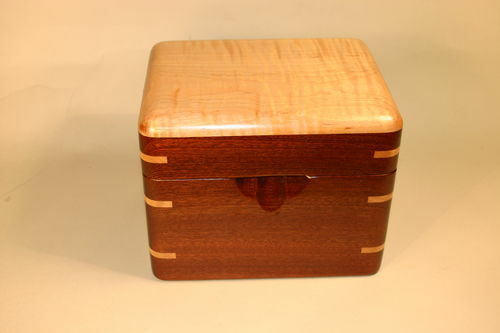 Bring your box up to the spindle for another quick touch. It should look like this. As long as you don’t move the guide fence, you can go back and re-sand any of your lifts and make them even or deeper by using the spacer jig. I use a 1” spindle with a 100 grit sleeve for sanding these. You may be happier with a larger or smaller spindle and a rougher or smoother grit. I find it is quicker to use the rougher grit and do just a bit of hand touch up when I am done. A wide variety of shapes and sizes can be achieved by changing the angles and the depth of the notches. Have fun with that. I also sand the outside edges of the notches, the top lid edge above the lift, and the internal ridges of the lift so it feels good to the touch when you open the box. Even with the set-up time, I can create a three part finger lift for most boxes in about 5 minutes…certainly less time than it takes to explain how to do it in this forum. A Simple Method: If you are just making a box or two I have a less elegant, but accurate way of doing this. I used this method while I was developing what I have shown above. 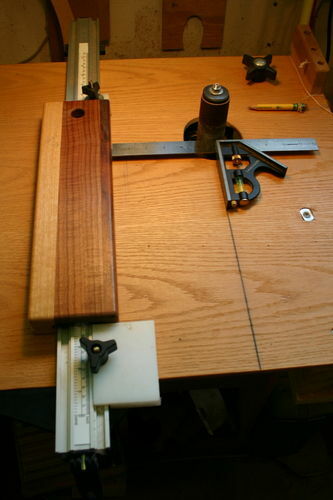 Use a combination square to set a locking or clamped straight edge as I described above, but tape a 5/8 piece of wood to the side of your guide before you set your guide in place. 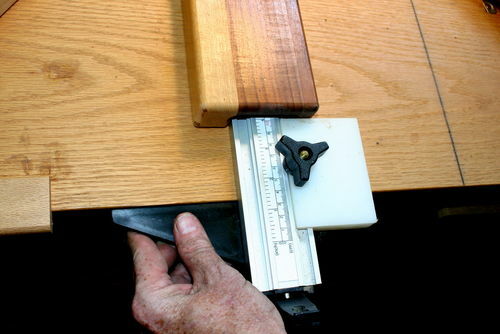 Slant your table and cut your center indent. 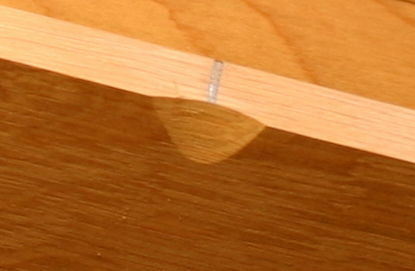 Remove the tape and 5/8 strip and cut the new indent at a steeper angle. Add a 1 1/4 inch spacer taped to the side of your guide. At the same angle as the last cut, sand out the other indent on the side of the center cut. 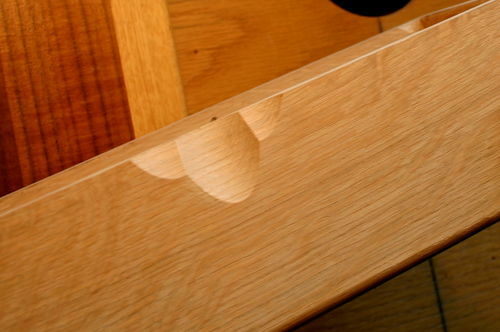 This method uses no jigs, no table modifications, and you don’t have to have a clamping straight edge. As always, thanks for looking and all comments and suggestions are appreciated. Keep boxing and keep posting. fantastic jig. takes the sander to another level. Great tutorial! i’ll be trying this soon… thanks to you! Big Al, I like your method, when you move to the hand sanding stick, what do you think about using a dremel with a sander on the end, the Dremel is what I use to make my finger lifts. I do similar what you do, I find the center, then I measure out 1/2 on both side of the center line then make a pencil marks then using my dremel I start on the center line slowing digging it out while moving back and forth to the outside marked lines but I would like to incorporate the triple finger lift. Nice job on you tutorial Al. I learn a few things here. Very kool BigAl. Appreciate the how-to. Another great use for my spindle sander! Thanks for the tutorial. Thanks for the feedback. If you have questions or problems, feel free to send them my way. Keep boxing and keep posting. Just spent most of my morning going through your blogs. Enjoyed every one of them and appreciate your attention to detail and no nonsense, clear and concise explanations. Pictures are all great and like you suggest mostly self explanatory. Look forward to more when you have the time. Great info Al. Thanks for taking time to post your tips, tricks and expertise. I know I will use much of it on future projects.